Summer Eyes with a Bright Pop of Color! Even a makeup lover like myself can become bored with their everyday makeup. Now that Summer is almost here I thought it would be a good idea to change-up my neutral makeup and add a bright pop of color. Although I do love a bold, bright lip I thought it would be fun to try a new eye look using some fun summer-friendly colors. COVERGIRL recently launched a new “FLAMED OUT” collection featuring a new mascara, single eyeshadows and shadow pencils as well as a new long-lasting eye liner,“Ink It” by Perfect Point Plus. These new COVERGIRL products gave me everything I needed to achieve the perfect bold summer eye look. To achieve this stunning eye look I used three main products- the COVERGIRL “Flamed Out” mascara in Black Blaze (305), COVERGIRL Ink It! 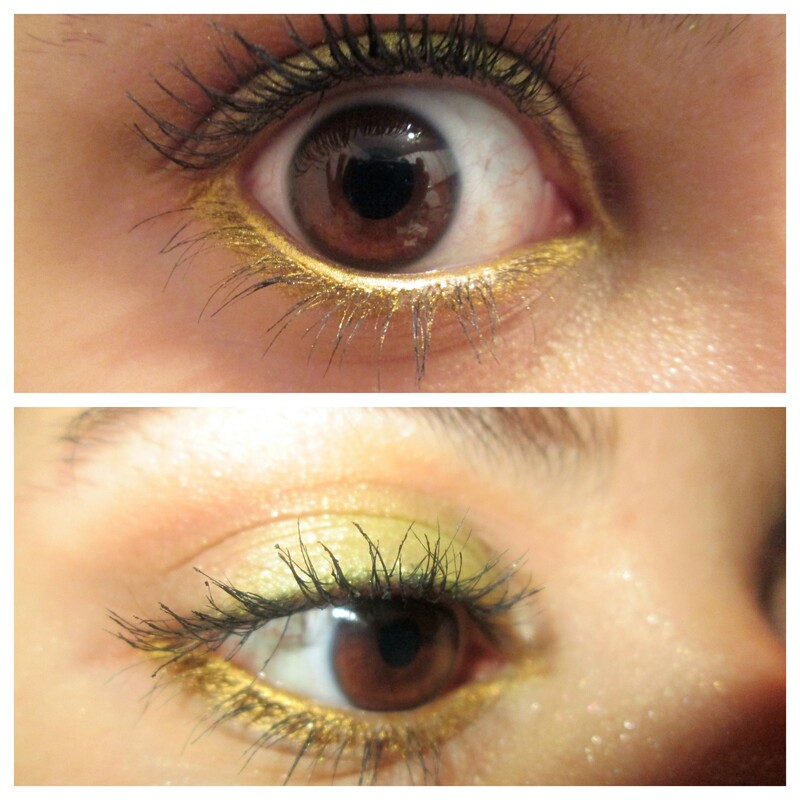 eyeliner in Golden Ink (235) and the COVERGIRL “Flamed Out” Shadow Pot in Lime Light (310). First, for a gorgeous wash of color all over the lids I used the new COVERGIRL Flamed Out Shadow Pot in Lime Light (310). This lime green shade is the perfect color to make my brown eyes pop. The shadow was super easy to apply and blended beautifully all over the lid! I also added a soft warm matte brown shadow to the crease to add some more definition to my eyes. These shadows come in 12 different colors. Whether you’re a neutrals lover or wanting to try some more daring shades there is definitely a color for you! Next I applied the new COVERGIRL Ink It! liner by Perfect Point Plus in Golden Ink (235)! It really glided on smoothly leaving a gorgeous and pigmented golden color to my waterline and lower lash line. It did not move at ALL throughout the day. This is a perfect product for those who struggle with liner that creases, smudges and fades throughout the day. This Ink It! liner comes in six bold shades. I am absolutely in love and definitely picking up some other colors ASAP! 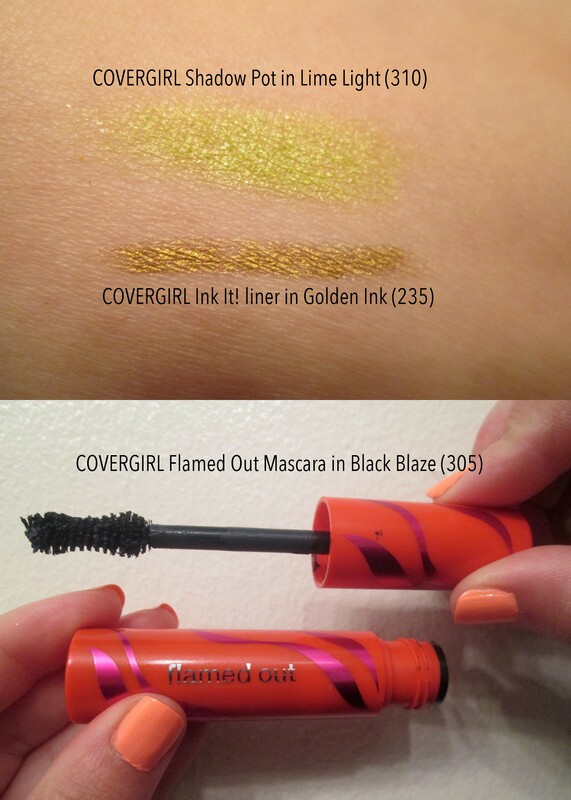 Last ,but not least, I used the new COVERGIRL “Flamed Out” mascara in Black Blaze (305)! The new, innovative “Volume Igniter” brush coated each lash to the fullest extent, while giving the perfect amount of volume. I really enjoyed the fact that the mascara did not flake or smudge at all throughout the day, which is a must during the summer! The new “Flamed Out” mascara even comes in a water-resistant formula for those who prefer waterproof mascara. 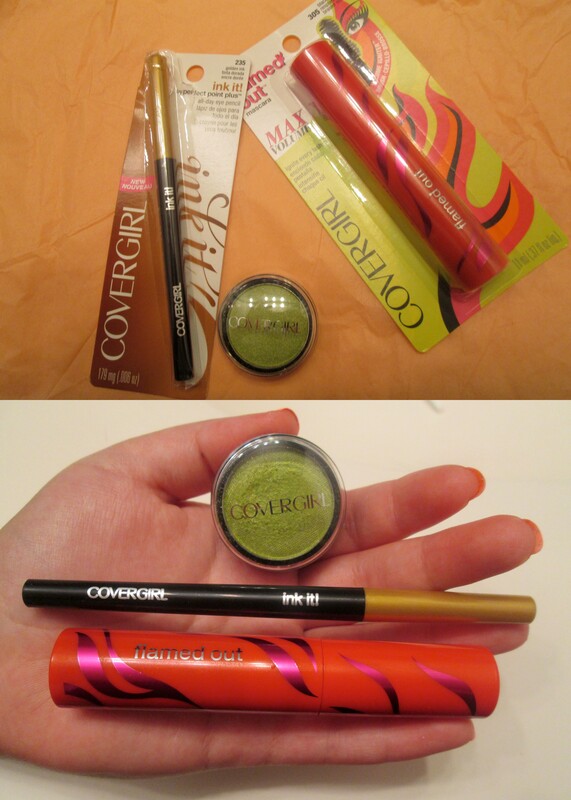 Thanks so much, COVERGIRL, for sharing these awesome new products with me! Disclaimer:As always all opinions are my own.